If a slide has to be moved independently from the opening of the injection moulding machine, this is usually achieved with a hydraulic cylinder. For large injection moulded parts, the surface on the slide is often so large that a normal hydraulic cylinder cannot withstand the enormous injection pressure. This is usually solved in the design phase by adding a locking mechanism from the side. In addition to design time, this also requires some additional and expensive precision components and machining. Due to the additional space requirement, the mould may also become larger under certain circumstances and may have to be moved to a larger injection moulding machine. The E 7055 Locking cylinder moves the slide directly. 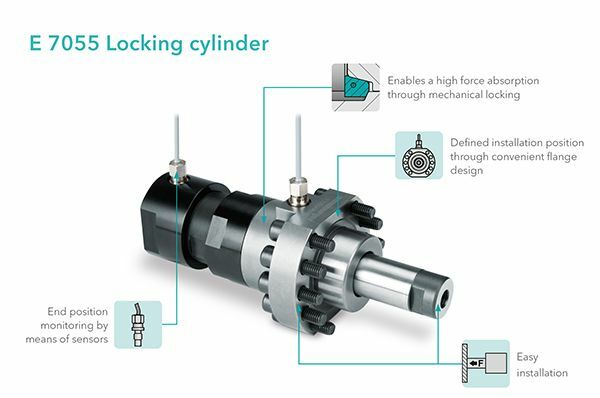 Thanks to the mechanical locking mechanism integrated directly in the cylinder, a compact cylinder can be used despite the large slide surface. The position of the oil port is defined by the flange design and can be conveniently connected. The end position is monitored by the high-pressure resistant sensors. As a part of the Meusburger Group, the Meusburger company is the market leader in the field of high-precision standard parts. Customers all over the world make use of the advantages of standardisation and benefit from the company’s over 50 years of experience.